Amniocentesis may be performed to determine if the baby of an Rh-negative woman is having problems. It may also be done to determine fetal lung maturity before delivery. It may be a good idea to have amniocentesis if your healthcare provider suggests it, even if you would not end your pregnancy should results indicate a problem. If a problem is detected, you and your family can prepare for it. You can gather information about the problem so you and your family are informed about what lies ahead. Amniocentesis near the end of pregnancy can determine if a baby’s lungs are mature. The test may also indicate the need for additional tests to determine if the fetus might have other problems. If any are found, steps can be taken to ensure the delivery goes smoothly and any necessary procedures are done as soon after the birth as possible. Ultrasound is used to locate a pocket of fluid where the fetus and placenta are out of the way. Skin over the mother’s abdomen is cleaned and numbed with a local anesthetic. A needle is passed through the abdomen into the uterus, and fluid is withdrawn with a syringe. About 1 ounce (30g) of amniotic fluid is needed to perform the tests. The test can identify about 40 fetal abnormalities. Bleeding from the fetus to the mother can occur during amniocentesis, which can be a problem because fetal and maternal blood are separate and may be different types. This is a particular risk to an Rh-negative mother carrying an Rh-positive baby and may cause isoimmunization. An Rh-negative woman should receive RhoGAM at the time of amniocentesis to prevent isoimmunization. In a multiple pregnancy, genetic testing can be a complicated procedure. For example, in most multiple pregnancies, each baby lies in its own sac. Abdominal punctures are required to withdraw fluid from each sac, which can increase the risk of complications. In the case of one sac shared by the two babies, only one puncture is necessary. Over 95% of women who have amniocentesis learn their baby does not have the disorder the test was done for. Fetal loss from amniocentesis complications is estimated to be less than 3%. Discuss the risks with your healthcare provider before the test. Only someone with experience, such as a physician at a medical center, should perform the test. 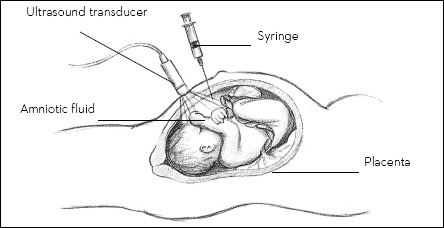 A disadvantage of amniocentesis is the time at which it is performed. Amniocentesis is usually performed for prenatal evaluation at around 16 weeks of pregnancy, making termination of a pregnancy (if that is what the woman chooses) more difficult. Some healthcare providers perform the test at around 11 or 12 weeks. However, not everyone agrees this early use is beneficial. - Why Do Pregnant Women Have Mood Swings?